Back to School is a busy time for educators as they set up their students for success — laminating name tags, creating bulletin boards and writing lesson plans. They know that for many children, the first few days back to school can make or break their year. As educators sharpen their pencils, the HRC Foundation’s Welcoming Schools program is working to ensure that schools also take the time to make classrooms a welcoming place for all by cultivating an LGBTQ and gender-inclusive learning environment. Don’t know where to start? HRC is here to help with these tips for developing LGBTQ and gender-inclusive classrooms and schools. Stock your library shelves with diverse books. Make sure students have access to books that reflect not only their lives but also identities and perspectives outside their experiences. Challenge stereotypes by featuring a Welcoming Schools recommended book as a first-day read-aloud. Create a welcoming bulletin board. We know displays are important features in every classroom, so why not switch out the apples and school buses for a display that shows diverse family structures and people of different races, gender expressions, and abilities? Use slogans that encourage respect for all people. 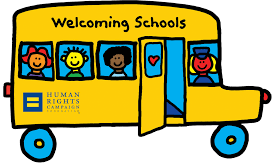 For an easy visual, print a Welcoming Schools safe school sign. Group students according to something other than gender. There’s no need to have boys’ closets and girls’ cubbies. Divide children by number or line them up by birth month, the color of clothing or alphabetically by name.